Bushara Island is a peaceful oasis away from the busyness of life! Are you on your way to see the mountain gorillas, or just looking for a retreat on your journey? Come to Bushara Island Camp, a popular resort on Lake Bunyonyi (“Lake of the Little Birds”). The first of its kind, the camp is a stopover to and from Gorilla tours, a bird watcher’s haven, and a private place for retreats. This small island is peaceful, safe, natural, intriguing to day-visitors and families, and a sanctuary for the weary traveler. The perfect location to get away from it all, Bushara Island is a wonderful place to relax in comfort surrounded by nature. 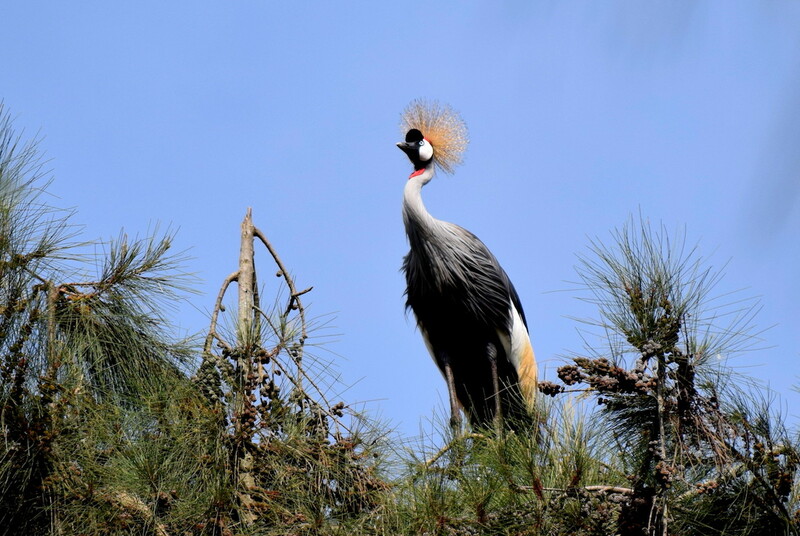 The green hills and papyrus swamps offer many opportunities for bird watching and Eucalyptus trees and shady nooks along private paths provide quiet places to sit and read a book. 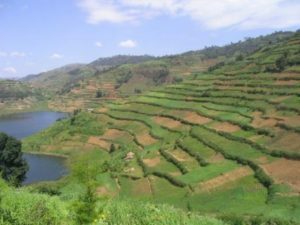 Most of the hills around the lake are farmed and homes can be found on the steep slopes. Bushara Island Camp is a sustainable eco-tourism resort focusing on raising awareness and promoting protection of the environment. 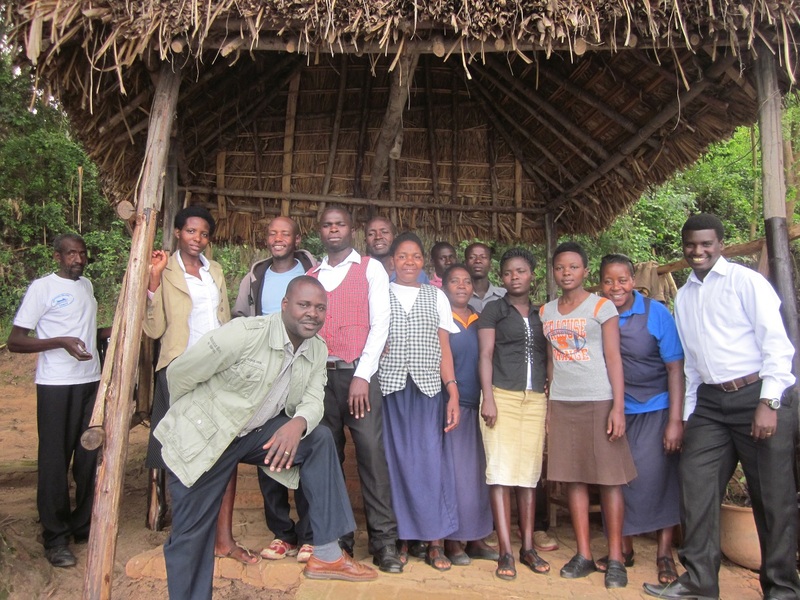 The camp evolved in response to the needs of the people of Lake Bunyonyi. Bushara Island Camp is one arm of a locally managed non-profit organization called the Lake Bunyonyi Development Company (LBDC). Profits from the campground assist local communities around the lake through activities like agro-forestry, small livestock distribution, craft co-ops, and hospitality internships for local college students. Your enjoyable stay on Bushara Island directly helps the local communities! Bushara Staff – waiting to welcome you! The volcanic lake is bilharzia-free and safe for swimming, canoeing, and for the more adventurous jumping off our rope swing. As well, we offer cultural tours, night-time canoe tours, several bird watching tours on the island and around the lake, and walking trails and benches for quiet moments. Besides the natural setting, we offer friendly high-quality service and a good selection of delicious and affordable meals at Swallow’s Nest Restaurant. Our luxury safari tents and range of cottages provide a variety of comfortable self-contained accommodations, each in a private setting with a view of the lake. 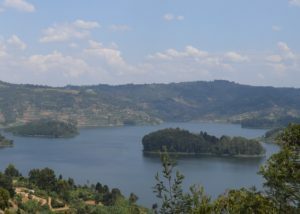 The Eucalyptus trees, papyrus swamps, and flowery plants of Lake Bunyonyi are home to over 200 species of birds, such as the Harrier Hawk, Fan-tailed Widowbird, Pin-tailed Whydah, Red-chested Sunbird, Tropical Boubou, Grey-capped Warbler, Cinnamon-chested Bee-eater, Paradise Monarch Flycatcher and the Red-billed Firefinch. The management and staff of Bushara Island send you a warm invitation to come, relax, and enjoy yourselves!